It is no secret; my husband and I are home chefs, cooking fans, foodies, food snobs, etc. Even though my mother in law keeps telling us we should open a restaurant, we are clear that even thought we might own one someday; we do not want to be the Chefs in it. We enjoy hosting, entertaining and cooking for our friends more as one of our favorite hobby. And mostly, we love watching professional Chefs in action and obviously eating their creations. 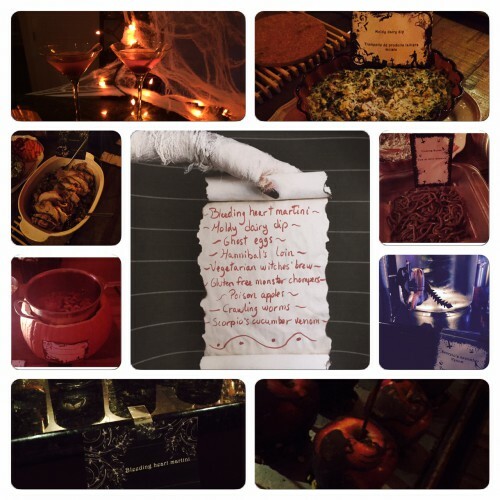 Having fun with our Halloween 2015 menu themed “Flirting with death” with amazing friends also contributing. I remember the first time I started watching the “Food Network” in 2009 when I moved to the United States. I immediately loved “Iron Chef America”, where a lot of contestants chose Bobby Flay as their opponent. I kept wondering what was it about him that everyone wanted to measure against. I just love how confidence, focus and composure exude out of him every single time he is in action. He definitely has this aura of “the guy everyone wants to beat”. What I love the most about him is that he is not afraid to compete with the best and the best are not afraid to compete with him. In “Throw down with bobby Flay” he toured all across the United States to measure himself against various award-winning chefs’ signature dishes. It takes a lot of boldness and humbleness to go out and play with the masters who can create deliciousness in their sleep. Even though he lost more time than not in that show, I kept telling myself how smart it was. Can you imagine how much more he learned by cooking side by side with other food authorities? Like him or not, he is a leader in his field and I have a huge amount of respect for those who keep pushing themselves beyond what they know. Below is a combination of 10 things that makes him be the best and contributes at doing justice to his culinary chops! Masters never assume they know everything; they navigate through life consistently expanding their horizons confidently. Self-Expression Manifesto of the week: Masters never assume they know everything; they navigate through life consistently expanding their horizons confidently. Join the conversation: What have been some of the best combination of qualities you have seen in the leaders you admire and what makes a master to you? Previous Post Previous post:The impact of leaders in action – Are you up for the challenge? Next Post How wide is your capacity to be with others?